Here is a great recipe for those of you who love pecan tarts. 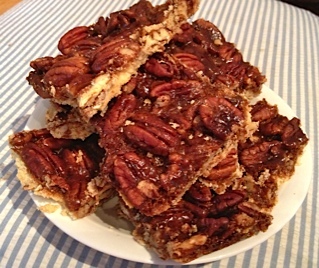 Made with an almond crust, coconut sugar, and lots of pecans, these are a much healthier version that the usual sugar-filled dessert, but still not something you want to be eating every day. 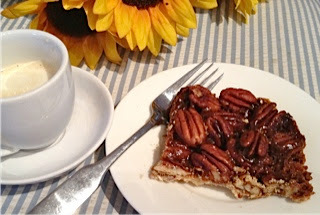 For an occasional indulgence, a small pecan bar with the perfect cup of espresso is my idea of heaven. This recipe makes lots, so you can cut it up, freeze it, and know you will always have a healthier alternative available whenever the local bakery starts tempting you again. Grease a large 9 x 15 baking dish with some of the melted butter. Mix the crust ingredients and press into the bottom of the pan until it is evenly covered. This isn't going to be very thick, just enough to give it a base. Bake the crust for about 10 minutes or until just lightly browned. While the crust is baking, mix the butter and sugar for the filling in a small saucepan. Cook over medium heat, mixing continually, until the sugar has dissolved. Continue cooking, stirring occasionally, just until the toffee starts to thicken. 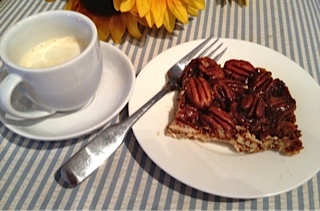 Spread the pecan halves evenly over the baked crust, then drizzle with the toffee mixture. Don't worry if it doesn't cover all the pecans. 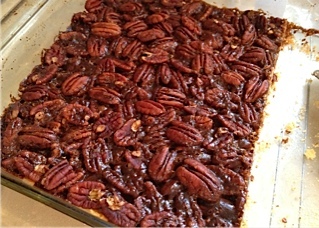 The toffee will spread while the bars are in the oven. Bake for 20 minutes, remove, and leave to cool completely before slicing. As you can see this is a pretty easy recipe with few ingredients. There is really only one thing to watch for - oven temperatures do vary and the nut crust can easily burn if you don't watch it carefully. If you're not sure, it's better to undercook it. After all, it will get cooked again once you add the topping.